A very gentle and slow massage technique used to drain lymphatic fluid from areas of congestion and swelling. Increases circulation and promotes the elimination of waste. Lymphatic drainage is very helpful for acute injuries or post-surgery. 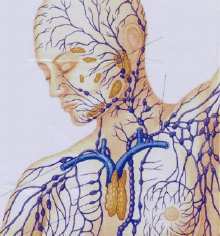 The lymphatic system consists of vessels and lymph nodes. The vessels contain a clear fluid which flows around our bodies. This fluid contains white blood cells which are cells designed to identify and destroy viruses and bacteria from our bodies which help us to fight infection. The main function of the lymphatic system is our immunity. The lymphatic system will pick up the viruses, bacteria or excess fluid and waste products through its vessels and transport it to the lymph nodes. There are many lymph nodes throughout our body. The more commonly known locations are your neck, axillary (armpits), inguinal (groin) and sacrum (tailbone). The lymph nodes contain an abundance of white blood cells that will clean the fluid before the fluid returns to our blood stream and normal circulation. When an individual sprains their ankle, the first response in an inflammatory response. There is an increase of blood to the area which will contain cells to help repair the injury but when this increased blood stays in the ankle too long, it bloats the area and puts pressure on the structures surrounding the injury creating pain and discomfort. The lymphatic system is responsible for picking up this excess fluid and the cells that were destroyed by the injury and transporting these to the lymph nodes, where the fluid will be cleaned and returned to normal circulation. Lymphatic drainage massage is a gentle, rhythmic hands on technique used to manually assist the movement of the lymphatic fluid. The therapist will start at a key lymph node locations and perform a rhythmic pumping action for a specific period of time. The vessels are then addressed and with a range of precise gentle rhythmic movements the lymph fluid is pumped towards the lymph nodes. The treatment is gentle and non-invasive. Conditions which can benefit from lymphatic drainage include acute injuries, post-surgery, trapped edema (swelling), lymph node removal as in cases of breast cancer. It is important to note that there are different levels of training for lymphatic drainage techniques. It is recommended that you personally speak to your therapist to ensure that he/she is trained to the level of practice required to treat the condition that you are wanting addressed. When the lymphatic system becomes blocked, lymph nodes may become swollen. Swollen glands could indicate a problem with the system or indicate that your body is fighting an infection so you should be evaluated by a physician before deciding to have a lymphatic drainage treatment. Self-help for your lymphatic system to flow freely includes wearing clothing that does not obstruct the flow such as tight waste bands, bras or socks. Gentle movements of breathing will stimulate and improve the lymph flow. In addition exercise stimulates the contraction of muscle tissue which will compress the lymphatic vessels and massage the fluid in the direction it needs to go.